One of the first things you will likely hear of when researching the Italian Greyhound breed is about their propensity towards broken legs. It is a natural concern when you have a small refined and dainty dog, which moves very fast, and has long thin legs. IGs are also born instilled with the knowledge and strong belief that they can fly. Add that into the mix, along with a dash of total fearlessness (otherwise more commonly known as a lack of common sense) when it comes to heights, and you have what seems to be the perfect recipe for a dog on crutches. I have some thoughts and experience to share on leg breaks, what causes them, and how they can be prevented. Now, I by no means claim to be an expert on the matter, but I will say that with over eight years of experience and involvement with this breed, and NOT ONE broken IG leg in any of my dogs, there must be something behind what I say. I believe the propensity towards legs breaks can be broken down into four basic areas: Genetics, Nutrition, Condition & Common Sense. I'll cover each of these below in detail. First though, I will touch on a common misconception: Size. I am frequently approached by people who have the impression that a smaller IG is more likely to fracture a leg than a larger IG. When asked why, the response I get is "because their legs are thinner". Back to basic physics 101 here, but I will say that size of the dog does not play a role in the likelihood of a leg to break. Size is relative. The thickness of a dog's legs will be relative to the body size and weight of the dog. It comes down to a matter of proportion. An 8lb 13" IG will have thinner legs than say a 16lb 18" IG. BUT, the smaller dog has less weight and mass coming down on those smaller legs than does the larger dog. Proportionately, the amount of weight, and therefore strain, being put on the bones of each dog will be comparative. Age as well is an important factor in breaks as a young pup's bones are soft and more easily broken. They will harden with age as the pup fully matures. For the purpose of this article though, I will look at what I believe are the four main areas behind leg breaks without taking age into special consideration. There can be a genetic predisposition toward broken legs in some lines, and in some "types" of IGs. Certain bloodlines will show a pattern of more common fractures through them, and I do believe that genetics and breeding can have an initial impact on the likelihood that a pup will have a fracture during its life. Certain types of IGs, especially those with poor bone density, brittle bone types, or long spindly thin "toothpick legs", are more likely to fracture as well. Yes, IGs have long thin legs, but if you have seen a dog like this, the best way to describe them is that their legs look out of proportion to their bodies - just too thin and lacking substance or bone. These type of dogs again, are more prone to leg breaks as they lack the proper bone to support their body in the first place. Nutrition is key. We'll start right from the beginning here. A puppy who's dam does not receive proper nutrition during her pregnancy, and while nursing her litter, is going to give a pup's bones a poor start on life from the get go. A growing puppy that does not receive the properly balanced diet and nutrition needed to develop strong healthy bones as he grows is going to mature with a higher chance of breaking one of those bones during his life. An adult dog that does not receive proper nutrition will not be able to maintain their bones in strong, healthy, and ideal condition. Hate to break it to you, but try to save a couple bucks per bag by feeding WalMart brand "OlRoy" dog food, and you're just setting yourself up for a couple thousand dollar vet bill. Take a pup that has a healthy, well fed dam and a great start, feed him quality food as he grows, supplement as needed, and keep him on a healthy balanced diet rich in the nutrients his body needs as an adult ... and you have just done wonders to improve your chances of never having a problem with his legs! Right behind Nutrition, Physical Condition is what I believe to be one of the leading causes of broken legs in Italian Greyhounds. These dogs look delicate, they appear fragile, they appeal to our natural tenancy to coddle and protect them. I will tell you, coddling your IG is one of the worst things you can do for him. Being overprotective will only hurt him in the long run. Now don't get me wrong, I am not saying to be careless with them either, but don't go to the extreme of being overprotective and limiting your dog's exercise and physical activity. If you allow your IG to become overweight, keep in mind that every added pound on that lean frame translates into additional pressure and strain on their legs that are not designed to cope with the extra weight. Keep your dog fit and trim. Not only for his legs, but for his overall health as well. Recent studies have shown that fit and trim dogs live an average of 2 years longer than dogs allowed to become obese. I know I'd love the opportunity for an extra two years with every one of my blessings. Keep your dog in good physical condition. This is an active breed. They are bred to run . . . Let Them. Allowing your IG plenty of opportunity to run, and play, and roughhouse, and climb, and exercise will only help. Your IG will build muscles and strengthen tendons in those legs. He will develop a strong and conditioned support system to be there behind those bones: Let a dog like that land in a stressful situation that suddenly puts a large amount of strain on his legs, and he has developed the muscles and tendons to provide support to his leg bones in that situation. Now take a similar dog that has been confined, crated, kenneled, and only provided with a limited amount of exercise, and put that dog in the same position of a harsh landing that puts a large amount of strain on his legs: This dog has no muscle tone to provide support, he has weak tendons from lack of use, all that stress and pressure is put directly on his leg bones ... and you end up with a fracture. Physical Condition is one of the main things you can do for your IG to keep from having leg breaks. While other influences already mentioned will come into play as well, I would say from my experience that Condition is the biggest key factor in breaks. Now this should be self-explanitory, but unfortunately it comes down to explaining what I call that "not-so-common common-sense". This one is easy. In one sentence: Do Not Put Your IG Anywhere He Can Not Get On His Own. Do not put your pup up on the couch, or lift him into the bed, until he is old enough to be able to get up there himself. As a general rule of thumb, once he can get up, he will be able to get down just fine. If you have to help him up there, you're asking for a problem when he flies/falls off. Do not turn your back - for even a second - if you lift your IG to a countertop to groom, or to the sink for a bath. Remember, they believe they can fly. A split second is all it takes for a brave and fearless little IG to launch during your moment of distraction or inattention. A split second is all it takes for you to put your IG in a situation to break a leg. Common Sense is simple, a little bit goes a long way for prevention. Now even if you do everything right, accidents can happen. A bit of strain in the wrong place, at the right angle, at the wrong time ... a split second and that is all it takes for any breed of dog to suffer a fracture. But by keeping these four key points in mind, and applying them to your IG, you can reduce your likelihood of ending up with an IG in a cast. There is no reason you can't live a life with IGs, enjoy this wonderful breed, and never have to deal with a broken leg at all! Genetics, Nutrition, Condition & Common Sense. 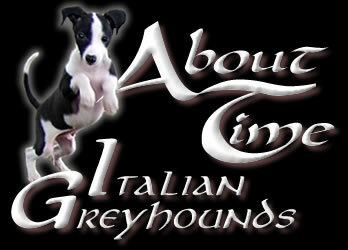 As I mentioned earlier, I have been involved with Italian Greyhounds for over 8 years now. My IGs are spoiled, yes, but they are not coddled. They have their own fenced off acre for a playground, full of logs, and tree stumps, things to jump on, leap off, and climb over. They run my 5 acre pasture with me and chase rabbits on a regular basis. They play with my Mastiffs, and roughhouse with the cats. I have never had an IG break a leg. Most IG breeders would watch my dogs play and cringe. I don't worry. I give them every opportunity to develop the muscle structure to provide a healthy support system to those little legs, and I've never had a single problem. I start my pups off right -from the very beginning- and I give this same advice to every new home I place a puppy in. I constantly hear from people inquiring about the breed "but they must be so fragile - every show I go to I see at least one IG being cared for with a broken leg". Now doesn't that tie right in... Consider your average show dog: He lives a well cared for kenneled life. He has good breeding, gets proper nutrition, comes out of his kennel run for scheduled training, and spends the weekends in a crate or exercise pen waiting his turn to be paraded around the show ring. Heaven forbid that dog is allowed to roughhouse, play, climb and jump ... he might hurt himself and damage his show career. Far better to keep him safely confined (coddled) in a restricted manner than take the risk. My response is to send them to attend an agility or lure coursing event - where the IGs are active dogs, athletes in top condition, and see how many broken legs they (don't) see there in comparison. This article was written by Laura Essenmacher, of About Time Italian Greyhounds. Copying, Posting, or Reproduction is allowed as long as article is copied and presented in full, unedited, full credit line remains intact, and this line is included. We Recommend Hartville Pet Insurance. With the rising cost of vet care, a good pet insurance plan is a simple and low cost way to give yourself the peace of mind knowing you will never have to make the call between getting your pet needed care ... and not being able to afford a big vet bill. In the event that something goes wrong, or an accident happens, make sure you won’t have to choose between your pet’s health and your finances. See how simple it can be to have peace of mind for your Italian Greyhound - Click here to get a Free Instant Quote for Pet Insurance from Hartville, a reliable company we recommend with reasonable rates, great coverage, and a low deductable.